One of the important components of the ‘National Master Plan’ of the city of Panama, the Panama metro began operations just recently, in the year 2014 and has since then become an important means of public transportation for the people of Panama. An important factor that lead to the construction of the first line was the idea of establishing a link between the center of the city and Los Andes County. Currently, a second line is being constructed to expand the reach of the metro. The 14 stations it currently serves, is soon set to become 15. A relatively small network, the track length falls just short of the 16 km mark and it’s daily ridership lies at 180,000 (2015). It is the El Metro de Panama who are responsible for the operations of this metro system. The Panama metro operates for 15 or 17 hours, depending on the day. On weekdays and Saturdays, the trains operate from 05:00-22:00 pm, while on Sundays and other holidays the trains begin operations only at 07:00 am and continue running till 22:00 pm. A standardised fare of 35 cents is applicable for those people who wish to use the metro service. Students get to benefit from special discounts. The price of tickets for them is 50% lesser, at just 17 cents per ticket with a maximum purchase of 2 tickets per day. It is only for those who wish to utilise the discount who are restricted to 2 trips. After 2 trips, students can still ride the metro but not at the discounted fare. The fares are only applicable on working days between 05:00-20:00 pm. Senior citizens and people with disabilities, too benefit from discounted fares for each trip. A single trip costs just 24 cents. Firstly, follow the general principle of letting the current passengers of the train exit the train before entering. In order to create a sense of order within the metro network, passengers are always requested to remain to right hand side. Smoking, drinking and the intake of drugs is prohibited within the metro network. So is eating inside the trains. There is no permission to travel with an animal of any kind. Extending one’s stay within the metro network is not allowed either as it is deemed as suspicious activity. Construction work on Line 1 started out in the month of February 2011 and took exactly three years for completion. It officially began operations in the month of April that same year, travelling between Los Andes to Albrook with as many as twelve stations along the route. Plans are in place to extend this line further up to San Isidro from the Los Andes end. Stretching over fourteen kilometers, this route features seven underground stations while the remaining are at an elevated level. There are seven kilometer worth of tunnels, trenches covering more than a kilometer and another five kilometer of route length covered by viaducts. The construction of Line 2 is expected to be taken up in two phases: the first will travel between La Dorba and San Miguelito while the second phase will come up between San Miguelito and Albrook. The twenty-one kilometer long stretch between La Chorrera and Albrook will be covered by the construction of Line 3 while Line 4 will run the length between Rana de Oro and Albrook. 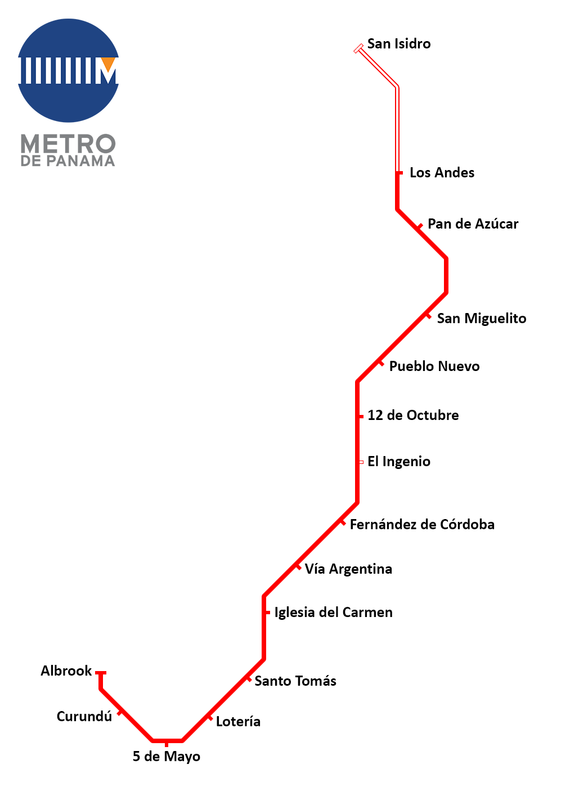 Map of Panama Metro showing its lines and stations. Click on the map to enlarge it or download Panama Metro Map in PDF.